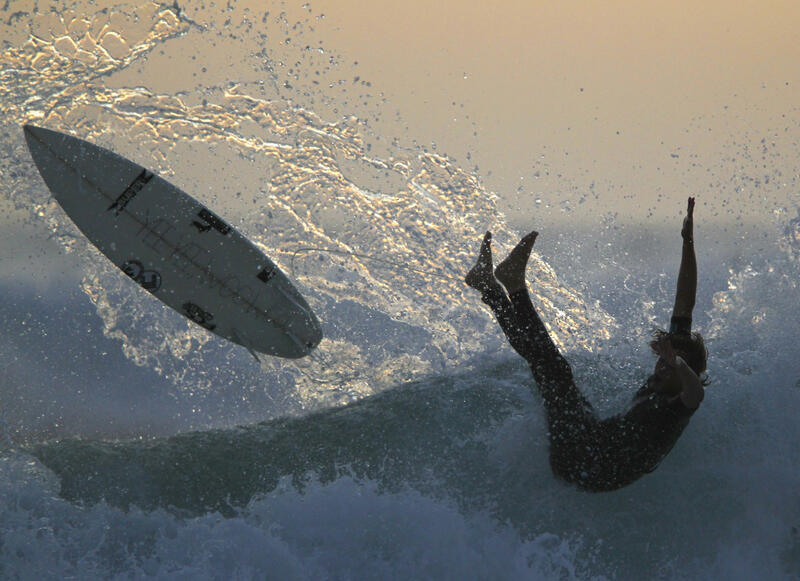 A surfer falls off his board while riding after sunset in Cardiff, California. The subculture of southern California surfers has long fascinated novelist Laleh Khadivi. She calls those who ride the waves there a "tribe unto themselves." "These surfers have found their God, it is the ocean, and they will come every day and pay homage to it," she says. But for Rez, the surfer dude protagonist in Khadivi's new novel, "A Good Country," the search for God and meaning in life is anything but mellow. Rez is the college-bound son of wealthy Iranian immigrants who enjoys catching waves and getting stoned. But despite doing well at his fancy high school, and bonding with a popular crowd, slights and betrayals accumulate and take their toll. Over time, something profound shifts beneath Rez, and he falls into radical Islam. It's a transformation that we read about in headlines every day, and still fail to understand. Khadivi's novel chronicles this young man's radicalization by going to places news reports rarely explore — those raw moments in adolescence when sides are chosen. The reader sees close up when Rez comes to the painful realization that he is "the other." "When he's young, [Rez] doesn't notice," Khadivi says. "As he gets older, and as the world becomes more fraught, as the notion of hostility between peoples comes closer to home and the acts of violence become something local rather than something he just hears about in the news, he begins to feel the brunt of this exclusion and the brunt of this discrimination." And as the final straw is piled on, Rez becomes a person that would make his parents and former friends shudder. "He realizes that there is another way to be a man in the world and he's got to seek that out," the author says. "It's the seeking out of personhood, of acceptance, of a kind of power as an individual and a citizen that I think a lot of adolescents who have gone toward ISIS have been looking for. And Reza is no different. He just cannot take it anymore and wants to go to a more powerful place." Khadivi says one takeaway from her novel is an appreciation that adolescent identities are in constant flux. "When it comes to teenagers, there's a way in which we have to be especially sensitive to their fluidity, to the fact that they are constantly looking for a group to fit inside of. And if groups keep leaving them out, they're going to keep looking for a group and that group might not be on this soil," she says. "It might be on the internet, it might be far away and it might provide a deeper lure than anything that can compete here with success in school or financial success or any of the other markers that make people feel comfortable." It's at least one hopeful insight for societies and parents struggling to understand the radicalization of their children.